Liftex® web tie-down assemblies fill a wide variety of material handling and load restraint needs on transportation equipment, as well as in industrial fields for a variety of uses. For a convenient way to tighten, hold or restrain almost anything, try Liftex® tie-down assemblies. If a standard assembly will not fill your needs, Liftex® will work with you to design a customized tie-down solution. Select a synthetic web tie-down having suitable characteristics for the type of load, environment and attachment to vehicle anchor point. Fittings shall have the required shape and size to attach properly to the vehicle anchor points. Identify the working load limit (WLL) marked on the synthetic web tie-down by the manufacturer. If the required markings are illegible or missing, remove from service. Read all warnings and/or instructions provided by the manufacturer. Identify the working load limit (WLL) of the vehicle anchor points. If no rating is visible contact the vehicle manufacturer for tie-down instructions. 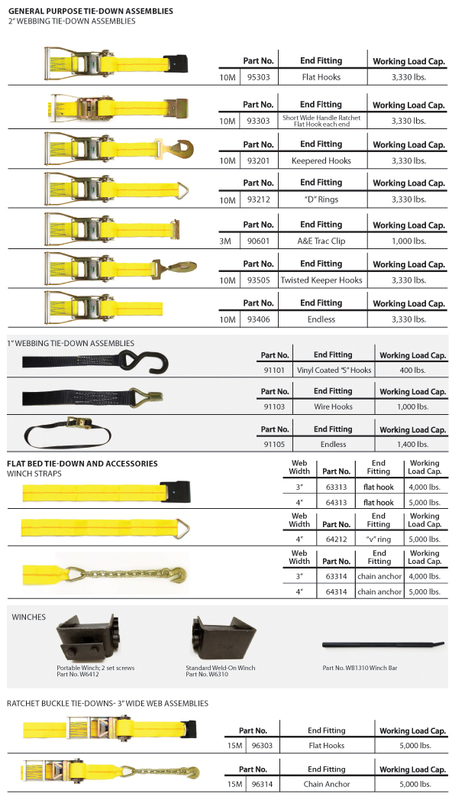 The lesser-rated working load limit (WLL), whether that is the anchor point or the synthetic web tie-down, shall determine the working load limit (WLL) of the securement system. Synthetic web tie-downs shall be attached to the vehicle and positioned in accordance with applicable regulations for the commodity being transported to prevent against shifting and/or loss of cargo. Synthetic web tie-downs should not be dropped or dragged on the floor, ground or any abrasive surface. Synthetic web tie-downs shall not be shortened, joined, repaired or lengthened by being tied into knots. Synthetic web tie-downs should not be pulled from under cargo when the cargo is resting on the tie-down. Synthetic web tie-downs shall always be protected from corners, edges, protrusions, and abrasive surfaces with edge protection that resists abrasion, cutting or crushing. Synthetic web tie-downs designed to secure cargo shall not be used for lifting, lowering or suspending cargo or for towing. Before operating any synthetic web tie-down assembly the user shall secure his footing to prevent slipping or falling. In adverse weather conditions, including freezing temperatures, additional caution should be exercised. tie-down and may interfere with proper operation. Synthetic web tie-downs shall be used, inspected and adjusted during the transportation of cargo per applicable federal, state, provincial, local and industry regulations.